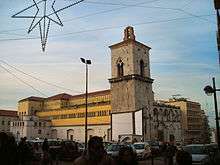 The Italian Catholic archdiocese of Benevento (Latin: Archidioecesis Beneventana) has a long history; it now has as suffragan dioceses the diocese of Ariano Irpino-Lacedonia, the diocese of Avellino, the diocese of Cerreto Sannita-Telese-Sant'Agata de' Goti, the Territorial Abbey of Montevergine, and the archdiocese of Sant'Angelo dei Lombardi-Conza-Nusco-Bisaccia. The Roman Catholic Diocese of Benevento was founded in the first century. During the persecution of Diocletian we find mentioned a bishop of this city Januarius who together with Proculus his deacon and two laymen was imprisoned and beheaded at Pozzuoli in 305. The see of Benevento was elevated in status to an archdiocese on 26 May 969. The cathedral of Maria SS. Assunta in Cielo was founded in Lombard times, but was destroyed by Allied bombings in World War II; it has kept the medieval Romanesque façade and bell tower, and the 8th century crypt. 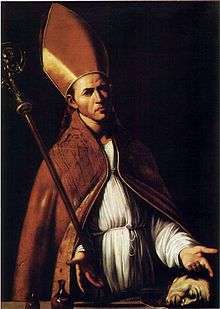 Saint Januarius (here in a modern depiction) was the first bishop of the diocese until his martyrdom in 305. ↑ Herbermann, Charles, ed. (1913). "Archdiocese of Benevento". Catholic Encyclopedia. New York: Robert Appleton Company. gives suffragans the diocese of Alife, Ariano, diocese of Ascoli and Cerignola, Avellino, diocese of Boiano, diocese of Bovino, diocese of Larino, diocese of Lucera, diocese of San Severo, Sant' Agata de' Goti, diocese of Telese, and diocese of Termoli. ↑ Salmeron, Marcos. Recuerdos Historicos Y Politicos Los Servicios Que Los Generales, Y Varones Ilustres Religion Nuestra Senora Merced, Redencion Cautivos han hecho los Reyes Espana los dos Mundos, desde su gloriosa fundacion, que sue el ano 1218, hasta el ano 1640. pp. 389–390. ISBN 9788400080679. This article incorporates text from a publication now in the public domain: Herbermann, Charles, ed. (1913). "Archdiocese of Benevento". Catholic Encyclopedia. New York: Robert Appleton.